This article explains how to set up your user and company information and settings. We encourage you to fill in the following information in the Settings tab before you start using Taimer. Choose your calendar start and times. Pick the language you want to use Taimer in. You can use Taimer in English, Swedish or Finnish. Fill in your email address. Without registering an email address you are unable to receive for example calendar invites. Download a profile picture. You can change and edit it anytime. Edit Account groups and names to suit you needs. N.B.! Groups lead, Partner, Cold and Account are default groups in Taimer. If you are happy with these groups, there are no need to make changes. You can create groups and edit group names later on. Set up your country's Mileage attributes. Feed in you country's Daily allowance attributes. If there are differences in Midweek holiday pay in your country,define the right attributes. 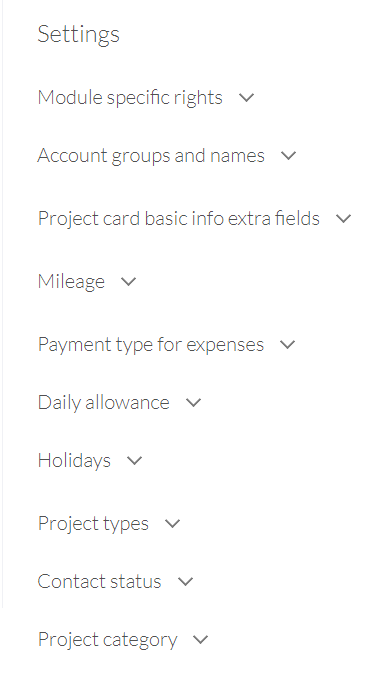 Set up Module specific rights, for example how calendar events and invoicing are handled in your company. Taimer needs to know your Address details for the purpose of invoicing. This is also from where you can choose your currency. You can change your company Logo and define whether it is added in prints such as cost estimates and covert letters or on top of your Taimer front page. You can give information for up to two Bank Accounts. At least one default account has to be fed to the system in order for the invoicing to run smoothly. User based pricing: You can price your employees' hourly work individually. Job type prices: Price your services based on the job type. Job types can be for example installing, production, customer service, project management and so forth. Create different Branches of Business in order to get a more in dept reports for hour usage in your company.